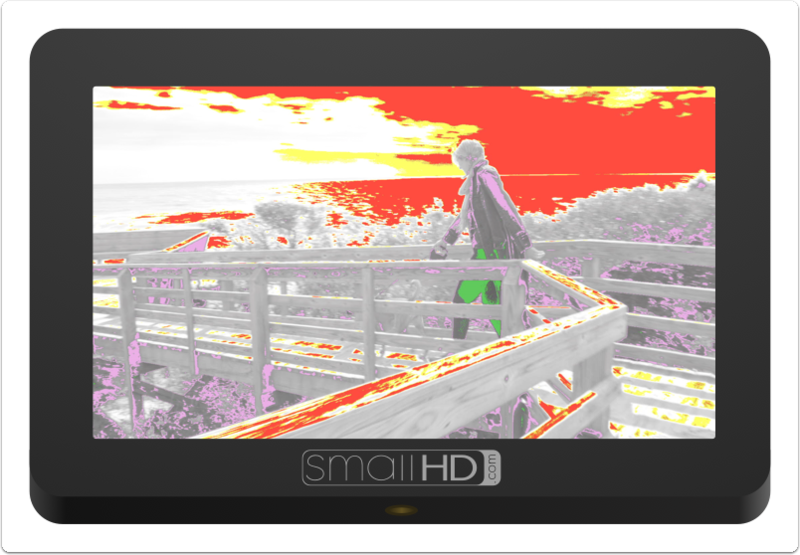 Either before or after reading this guide you will have an understanding of how to set proper exposure using SmallHD's industry-leading toolset. Learn how Waveform, Exposure Assist, Zebra, Histogram and Color Picker compare and how to get the most from each. Cameras have a limited dynamic range; this is the range between the darkest dark and the brightest bright a camera can simultaneously see and retain detail. If this range is set incorrectly, it can mean important details get lost or clipped. 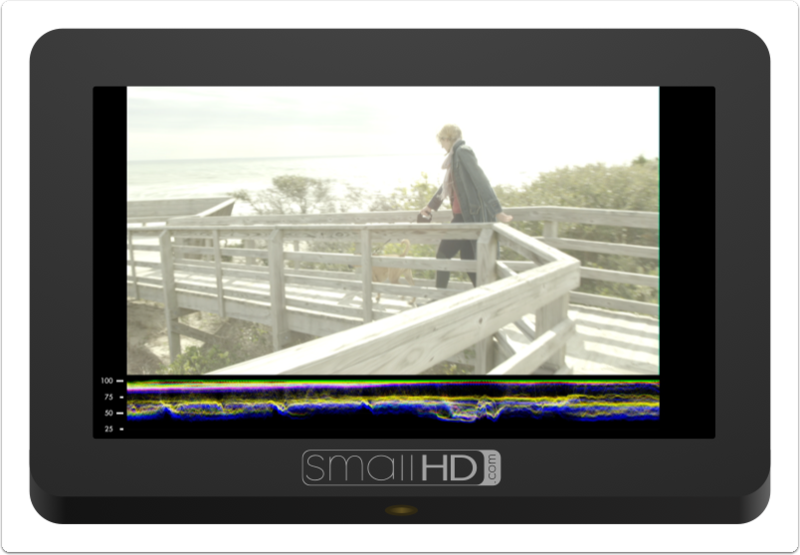 The philosophy of the SmallHD toolset has always been to help free up the operator's mental burden - combined with pages, SmallHD's tools are designed to promote a level of confidence in the technical aspects of a shot to help free up creative energy. We haven't performed a formal study but we'd wager shooting with SmallHD monitors decreases stress on set. 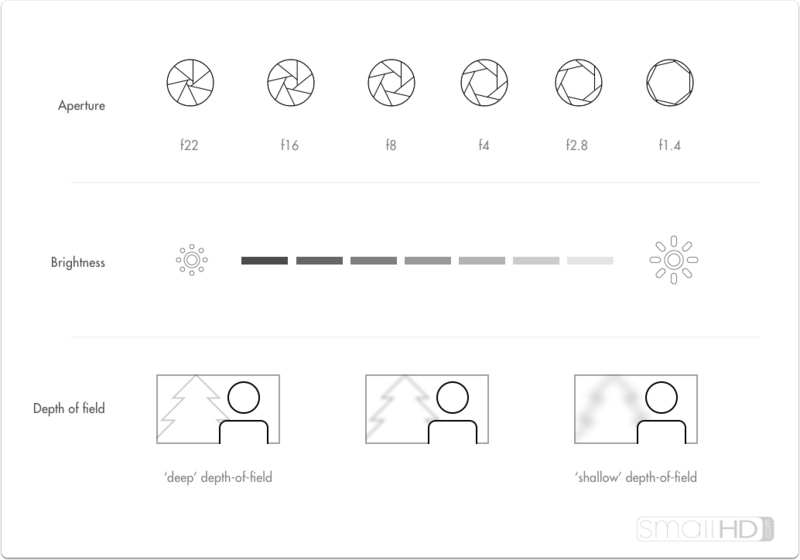 Ambient lighting conditions change human perception of on-screen images so drastically that eyeballing the exposure range without aid can be highly risky; tools that present the range clearly are generally considered critical for consistent footage gathering. Adjusting exposure will shift the dynamic range to capture brighter or darker detail in order to accommodate the most important aspects of the image. Anything outside the dynamic range gets clipped, meaning a badly placed exposure is wasting the camera's potential. 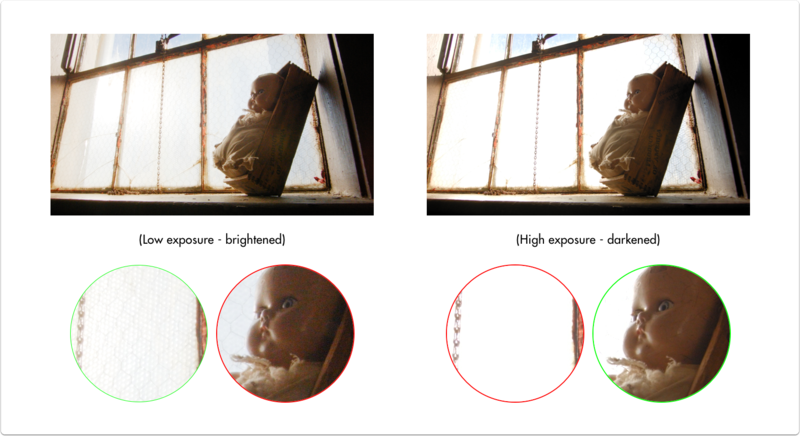 Let's look at the problems we face with a shot with a relatively low exposure (underexposed) and one with a relatively high exposure (overexposed). There will almost always be something in your image that is clipping like a dark shadow or a light bulb - the key is to be aware of and balance the extremes while ensuring the desired midtones (typically skin tones) are placed in the center of the camera's dynamic range. If you have the benefit of a set with controllable lighting, the best scene exposure can be generally achieved without touching the camera. Because this is such a huge topic, we will just be covering adjustments that can be made on-camera. The most commonly used method for controlling exposure, the Iris or Aperture adjusts the physical size of the opening in the lens at which light passes through to reach the camera's imaging plane. Speed - Iris/Aperture is most often a physical ring on the lens, making it very quick to turn and immediately see a result. Fine-tuned control - Higher-end & cinema lenses often have smooth or ‘de-clicked’ aperture rings making very precise exposure adjustments simple to achieve. Affects depth of field - If part of the intended look of the scene is to have a character in focus with the background blurry, just be aware that adjusting the iris will affect the amount of blurriness (bokeh) in out-of-focus objects. Increasing camera ISO essentially 'boosts' the camera's image digitally beyond its native ISO level, brightening the image but increasing the likelihood of image noise. Flexibility/Night Shooting - Some cameras have incredibly low-noise sensors and effective noise processing that can allow for high ISO values without noticeable artifacting meaning easier shooting in the dark. Mileage varies greatly and older cameras tend not to fare as well in this respect. 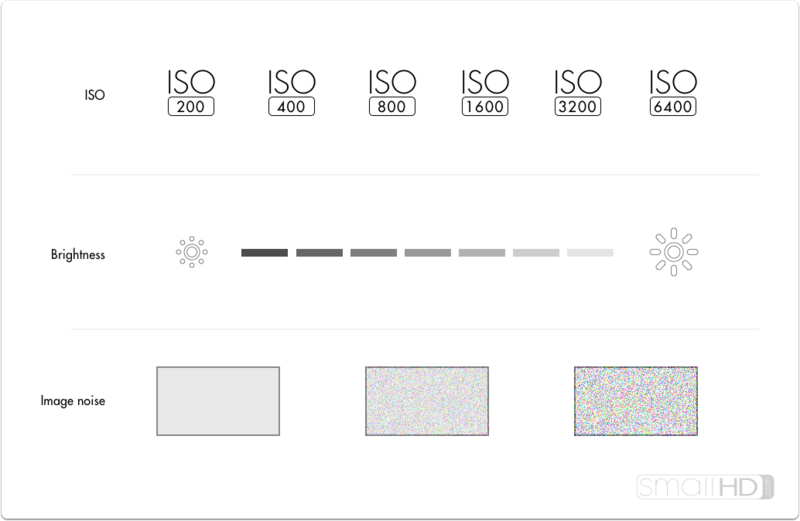 Variable Image Noise - Because adjusting ISO is artificially ‘boosting’ the output of the sensor, image noise, especially in shadows becomes more apparent at higher ISO values. Every digital camera has a native ISO which tends to produce the least noisy results and the most dynamic range. Pushing the ISO up is asking the camera to reach further outside its 'comfort zone' and will increasingly apply image noise/lessen dynamic range. 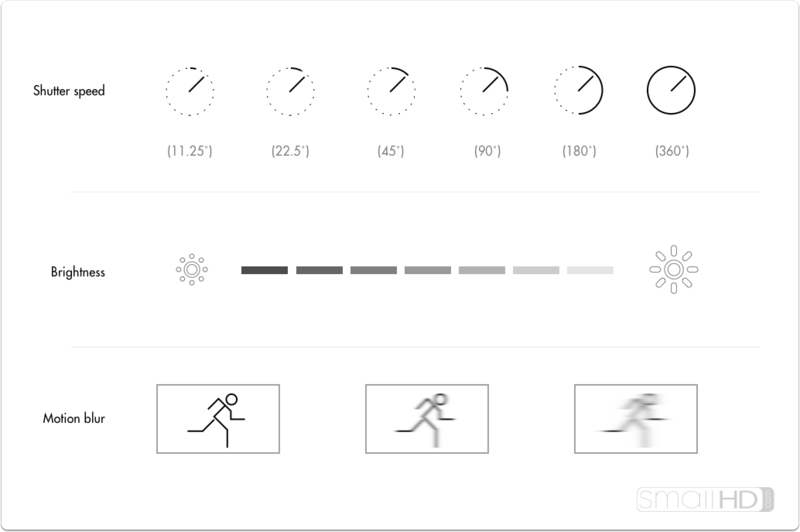 Shutter speed refers to the amount of time the sensor is being exposed to light for each frame. Shutter speed is slightly less commonly used when adjusting exposure due to it having a more pronounced stylistic effect at different extremes. Controls perceived ’smoothness’ of motion - if footage motion appears too smooth for the intended style, increasing shutter speed will increase a ‘strobing’ effect, think the ‘Saving Private Ryan’ look where action appears frozen in time. Consistency of shots - If adjusting shutter speed for every shot to compensate for lighting, the amount of ‘strobing’ (ie perceived smoothness) will vary shot-to-shot as well and this may be displeasing to some viewers. An extremely common & widely acceptable shutter speed setting is at half the frame rate being captured, commonly referred to as a 180˚ shutter. If shooting at 24 frames per second, this means the shutter speed would be 1/48th of a second. Lens filters offer creative flexibility on brightly lit scenes - instead of having to raise shutter speed and increase strobing, or close down the aperture and deepen the depth of field, ND (neutral density - aka darkening) filters can darken the shot without adjusting the aesthetic. Shallow depth of field on bright days - dense ND (neutral density ie darkening) filters make shallow depth-of-field possible on very bright days - other options are to close down the iris (resulting in deep depth of field) or increasing shutter speed (resulting in stuttery motion). Localized Adjustments - ND filters often have a graduated (dark to light) effect so that adjustments are made only to a portion of the image - great for dimming a bright sky while keeping a darker foreground in tact. Speed of operation will vary - Many cameras have built-in ND filters which are speedy to operate but for cameras that dont, they will have to be threaded onto to a lens or slid into a matte box which can be slower options than rolling the iris/aperture. We have found personal preference to be the biggest factor when choosing an exposure tool. Wish to see exposure issues directly on the image as they happen? Exposure Assist or Zebra may be right for the job. Prefer an untouched image with a separate graph to provide value readings for spotting issues? Waveform or Histogram may suit your needs better. Exposure Assist is a great overall balance of utility and ease of use and can benefit most shooting scenarios. It allows ‘painting’ the image depending on the intensity of a pixel's luma value. For example you could set 97% IRE and up to turn bright red as an overexposure warning while creating a scale to turn green when a face is exposed properly at 55%, etc. (& anything else you wish to plot to any points on the range). Click to learn more about Exposure Assist. New firmware 3.0 feature - Exposure Assist scale is now fully customizable! Zebra is essentially a simplified version of Exposure Assist which allows the specific ‘painting’ of areas depending on brightness value but is less destructive to the underlying image -- it is however limited to painting one value range at a time, though up to two Zebra tools can be activated simultaneously. Click to learn more about the Zebra tool. Waveform plots the value of the entire image onto a graph that physically matches it from left-to-right, meaning if you see an area that’s too bright on the left side of the image, it will create a 'peak' on the left side of the waveform graph. It also has other benefits by way of RGB & RGB Parade modes. Click to learn more about the Waveform. Use the Waveform to check evenness of lighting across a solid-color backdrop- just look for a straight line all the way across. Histogram sorts every pixel in your image based on its brightness and plots it to a chart; darker values on the left and brighter values on the right. Click to learn more about the Histogram. If you see that the Histogram is mostly a 'lump' towards the left hand side, you may have a generally under-exposed image (or a normally-exposed night scene). If it is stacked up towards the right, you may have an over-exposed image (or a normally-exposed day time snow scene). Color Picker samples color/value information from a single pixel to give a precise readout of a specific location. Click to learn more about the Color Picker. When you need an extra level of information on a very precise location, set up a color picker on your subject's face and as light levels change, roll exposure or relight to compensate to achieve the same or a similar readout.